Jennie and Liz say that I have to be more upbeat when it comes to the newsletter; I say I am just reporting what is going on here at the farm occasionally with some editorial comment. Hey, it’s like a reality TV show but in real time, what happens is sometimes not under our control and I tend not to sugarcoat things. To that end, we have had a great week and been going like a house a fire getting a lot done. There is always a week in the spring when all of a sudden the pace quickens, normally it is a few weeks earlier in April but this is the week. Usually it corresponds with the beginning of deliveries to Weaver Street Market and warmer weather. It is later this year due to the cooler spring and the fact that all of us local farmers were delayed getting most of our springs crops in the ground because of the wet conditions and the cold. I have been predicting that the next few weeks will be spectacular at market with everyone harvesting huge amounts of produce, the heat this week will just push things along faster. 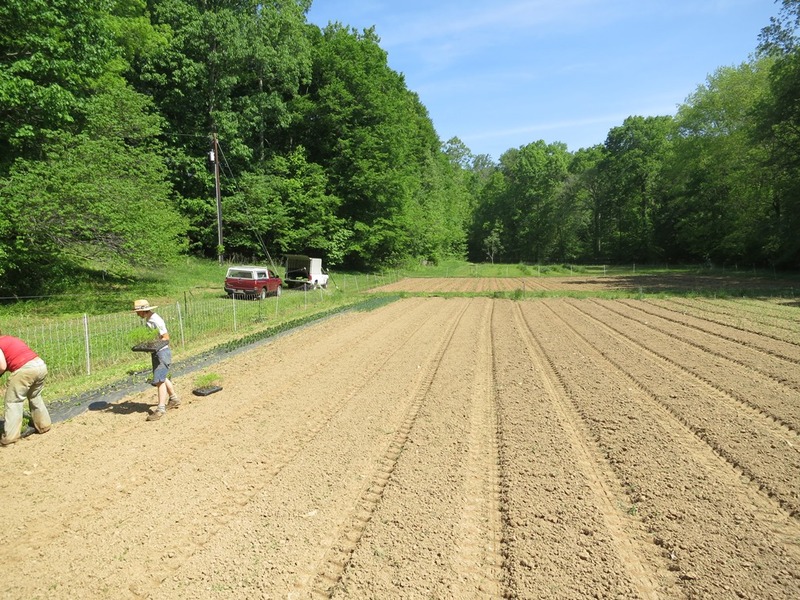 Lots of planting this week with the big winter squash field going in yesterday and more lettuce and flowers going in today and tomorrow, another half an acre all together. Of course with the heat we are having to irrigate everything to keep it moving and still setting up irrigation in the new crops too. Mowing, markets, deliveries it’s all happening now, compounded with the addition of Graduation and Mother’s Day festivities this weekend, we are running fast. Just one month out from the Farm to Fork Picnic. This year we are paired with our friend and good customer Bret Jennings from Elaine’s on Franklin. We are still working on our menu items but for sure a blueberry desert and something savory. Get your tickets now while they are still available and help raise money for new and beginning farmer programs at the Center for Environmental Farming Systems and the Breeze Farm in Orange County. Lots of good stuff for the Graduation and Mother’s Day parties. The lettuce is perfect right now; we have Green Boston, Romaine and Hearts of Romaine, Red Leaf, Green Leaf and Little Gem, Red Beets and Easter Egg and Red Radishes in the roots. Lots of Spinach, Baby Swiss Chard, Lacinato Kale and Collards for greens. Broccoli Raab. Green and Red Spring Onions. Cilantro. Some Turnips but we are having trouble with the yellow margined leaf beetle. More of the ethereal Poppies! Dutch Iris in blues. Bachelors Buttons and Sweet William. Asiatic Lilies. Bouquets for Mom. Man, this blog is plenty colorful, and a bottomless resource of information. Always a good read as well as being a good meter for where we should be in a week or to up here in zone 6.5. Thanks for starting to keep it all those years ago.